Below is an extract of an article by Roshni Kapur entitled ‘How Afghanistan’s Peace Movement Is Winning Hearts and Minds’ which was re-published by Truthout on September 22, 2018. The article was first published by Waging Nonviolence on September 13, 2018. 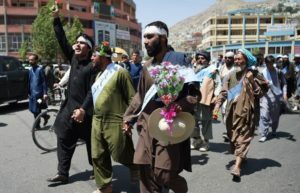 Their tenacity and courage attracted around a hundred Afghans from places like Kandahar and Herat to join their peace movement, including women … The protesters had covered over 370 miles by foot in a span of 40 days. They were given a warm greeting by Kabul residents who offered them food and water as well.